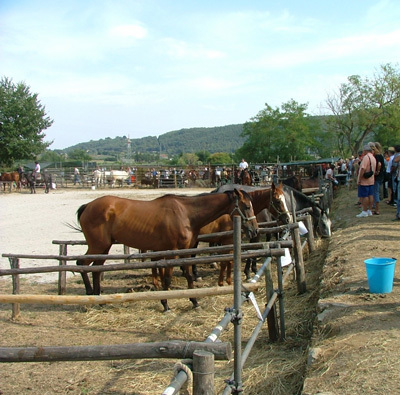 The "Fiera di Ghirlanda" is an annual autumn show of livestock and horses from Maremma's metalliferous hills, of wine production from the area of D.O.C Monteregio di Massa Marittima, and "produzioni tipiche locali", typical local produce. 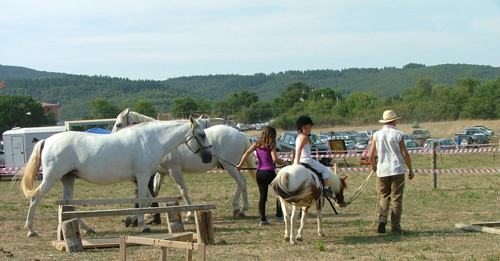 - Children and Horses - Baptism of the Saddle, and games for all the children. "Premiazione del miglior soggetto selezionata"
There are a small number of pens with large local Maremman pigs, piglets, bulls and cows, which children love. But, even though this is one of my local shows, to be honest as far as adult entertainment goes there isn't a lot to see as the show is dominated by row upon row of the type of market stalls that you can find in every town once or twice a week. The main reason for going - and we still do every year - is to spend a morning or afternoon outdoors in the countryside with friends. There's really no need to do the English thing of pre-arranging to meet, as nearly everyone from miles around will be there and you are bound to bump into some and have a good old chat as you wander around. Be aware though, that although the show is free, if you have kids with you you will be hard pressed not to return home with yet another halogen balloon! There are stalls of typical Maremman produce - cheeses, prosciutto hams, marmalades, and honey etc and these are growing in number each year. Plus professional mobile stands selling paninis with traditional porchetta (whole roasted pig stuffed with garlic, rosemary, and fennel and - lots of - salt) and lampredotto (boiled cows stomach). But they are outnumbered by ten to one by those selling "cacciatore" (hunter) outfits and knives, household items all for 1 Euro, shoes, clothes, pets, ethnic goods, and candyfloss... etc. Other than that, there is a corner with some shiny new tractor equipment on show - for marketing purposes - which the men tend to gather around. I have never understood the attraction, and still don't, but each to their own! 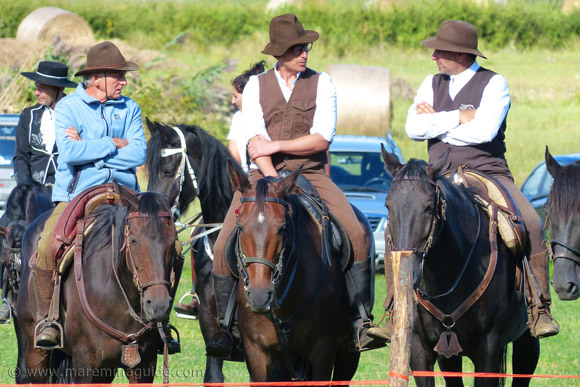 Three Maremma Cowboys taking time for a chat in between displays at the Ghirlanda fair: who says men aren't good at talking! Not sure about the body language though! For most, the greatest attraction is the demonstration of equestrian skill by the Butteri Maremmani - the last cowboys in Europe. (Just the one demonstration in the afternoon.) 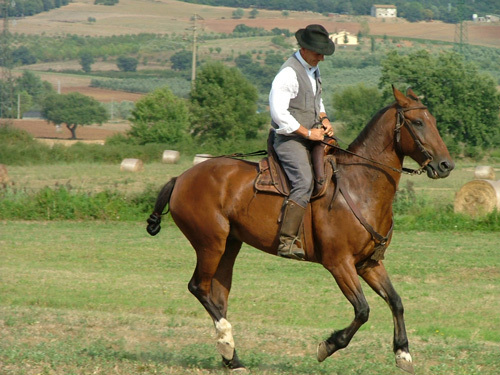 The Butteri are traditional Maremman shepherds astride the breed of Maremmano horses (also known as Maremmanas or Tuscan horses). They still tend to a small number of herds in Maremma today. Folklore has it that in 1890 the Butteri challenged Buffalo Bill to a contest of skill whilst he was in Rome at the Prati di Castello on his European tour of the Wild West Show. And on 8 March 1890 defeated him. 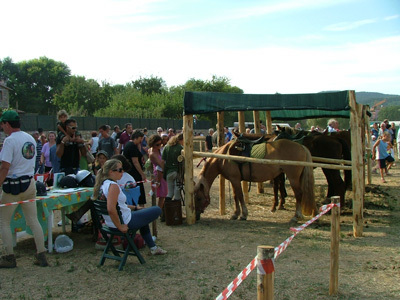 Festivals are now held during on the first Sunday in August in Maremma to celebrate their skills. Apart from the aforementioned mobile outlets, the local ristorante/pizzeria - Ristorante Trattoria Sbrana - does a flying trade in coffee and, when they are ready, hot fried zonzelle (or ficattole) pastries. A fried Tuscan dough. The owner comes outside the trattoria and calls out very loudly in a near musical way - it is Italy! - that the "dolce" are ready! They are not to my particular liking but are devoured with glee by my family and leave the trattoria like hot cakes - excuse the pun! The trattoria is located in the main street in Ghirlanda directly opposite the show. You can't miss it. They serve the best pizza for miles around - my little one is reluctant to eat a Margherita from anywhere else! - as well as having a great restaurant menu. I can recommend the fat homemade pici pasta with scampi and porcini mushrooms (an odd combination, but it works) and the mixed plate of fish for two. Getting to the Fiera di Ghirlanda by car is straightforward from Massa Marittima. Just take the road heading north around the town, direction Siena, and a few kilometres later you will arrive in the traffic queue for the car parks. These are on fields/land alongside the road, free, well organised and manned. A free bus service - provided by the Comune of Massa Marittima - runs from the town to Ghirlanda and back.